The condom distributing Boeselager of the Knights of Malta has blamed Cardinal Raymond Burke for the Order's crisis. Feel free to make Cardinal Burke a white martyr of the faith, but before you do Jorge, consider this. On February 1, Milo Yiannopolis was scheduled to speak to a few hundred. Violent fascist protesters in Berkeley gave him an audience of tens of millions. 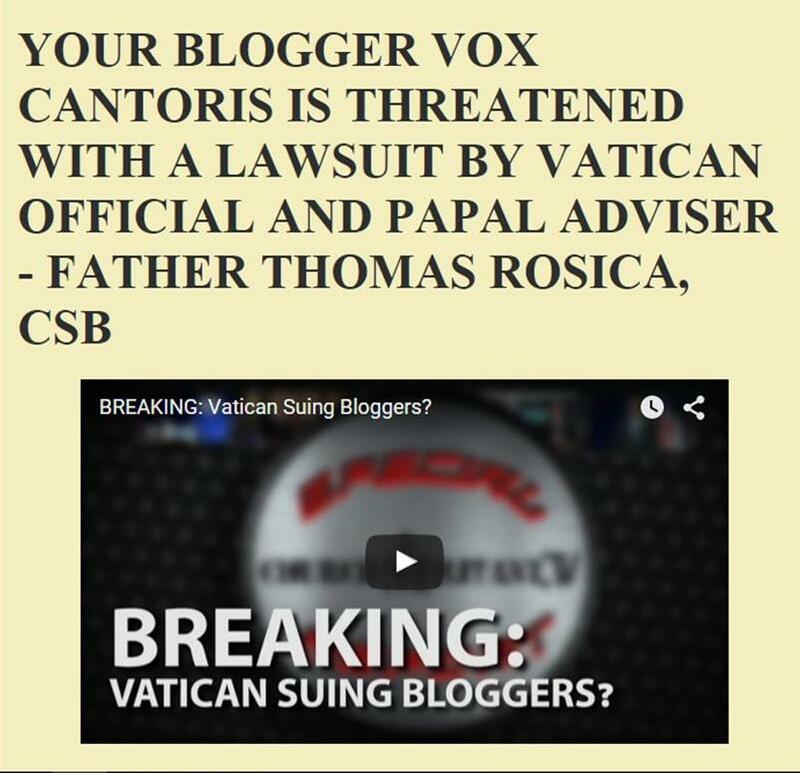 This blog had a few hundred thousand readers after ten years until Tom Rosica, that brilliant media-savvy clericalist came along. Now, it has a growing international audience. These occurrences are known as the Streisand Effect. Go ahead, it will be the real Francis Effect. Take away his red hat. You'll only make him a greater saint. As for the Knights of Malta, I feel great sorrow for two of my friends who are Knights, here in Toronto. Right, his conscience is clear because the Pope has told him that as long as he thinks God is ok with his sin then he should "sin boldly" in the words of the heretic Luther. These are clearly the words of Satan "did God really say that?" "you won't die" same old lie, same old deception that your conscience trumps God's law. Jorge would not want to touch Cardinal Burke any more than he already has; if he does you can guarantee there will be a massive wave of true Catholics ready to fight for this great and Holy Cardinal. Jorge has already step outside the boundary of Catholicism, touch Cardinal Burke, then Jorge will see the consequences of his action. What is disturbing in all this is that the call for the spiritual renewal of the Order is a ruse "for something deeper" as Jorge would say. According to history, Fra' Bertie and Fra' Festing did quite well on the spiritual front. Consider that in 1993, the Grand Priory of England was restored after being in abeyance for nearly 450 years except for titular Grand Priors. Not bad for something that needs spiritual renewal. Furthermore, the number of First Class Knights in Britain were exploding. It is estimated that based on current trends, the near future would have the British Association churning about 5 members a year taking Perpetual Vows of Poverty, Chastity and Obedience. Once again, not bad for an Order that needs spiritual renewal. Unfortunately, on this front, the German Association is lagging behind with so few taking perpetual vows. With the prospect of being massively outnumbered in the First Class of Knights, which are the chief decision makers in the Order, it is likely that the German members saw the writing on the wall. Their days were numbered. Money alone could not help them. So now the little "condom-heads" run to Jorge. I would say let the biological solution set in. Let the condom heads get old and grey as they get outnumbered by the faithful members. But something tells me there is a more sinister plot at work. Dare I say: to eliminate the First Class. Hey, if Jorge can lay desolate his archdiocese, both in Buenos Aires and Rome, why not a whole Order. No good will come of this for the Former Sovereign Military Order of Malta. I'm not saying that because I know anything about the order, just that nothing this pope gets involved with is going to thrive, it is going to wither and die. But if Cardinal Burke is given any further punishment or humiliation for being faithful to Our Lord and the Gospel, they will hear from us. That will indeed be a deal-breaker. I believe he will do it, because there is nothing this imposter in the Chair of Peter seems to love more than poking faithful Catholics in the eye and humiliating a faithful cleric. Words fail. The Former Sovereign Military Order of Malta, as well, has shown itself to be a puny organization of puny men. Sadly, they are no longer knights. Knights are noble defenders of the good. Francis has gelded them. What a shameful debacle.